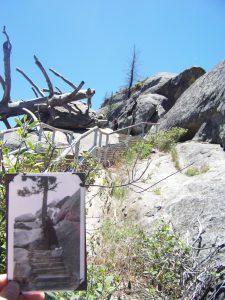 May 31-June 2 – Earl and Ethel’s photo album had three pictures tied to Sequoia National Park. 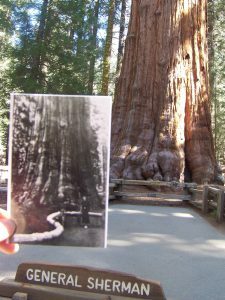 Two were separate photos of each of them standing in front of large Sequoias. 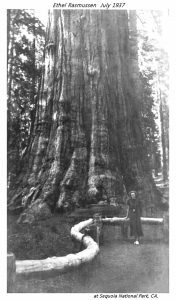 Some time earlier we confirmed that Ethel’s photo was in front of General Sherman, the largest living thing on earth. 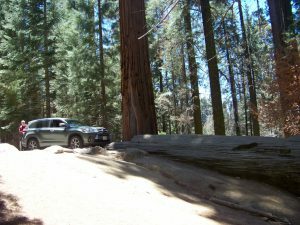 Our pilgrimage to Sequoia NP was built around getting to the General and duplicating her picture. The photo of Earl was a challenge because his photo did not have enough visual clues to locate a specific tree. We know it was a special tree because it had fencing around it to keep the public at a distance even in 1937. Although we tried, in the end we were OK with not knowing the location of his photo. We have had so many incredible picture locations confirmed for this trip. 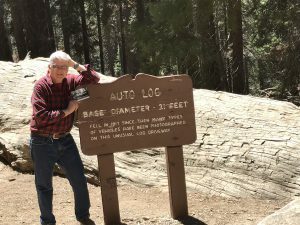 Their third photo was of the “Auto Log” and also a Sequoia NP destination for us to re-create. 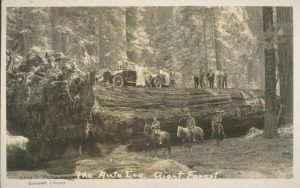 The Auto Log was a popular park attraction during its time. 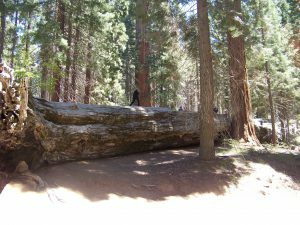 It was originally created when a large Sequoia fell toppled on its own in 1917 and the first park director had a side road installed to allow vehicles to drive on top of the tree for a photo. 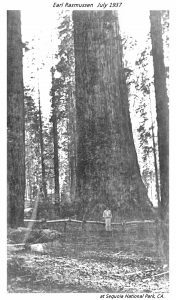 Their thinking was such photos would convey just how big the Sequoia trees were to folks back home. 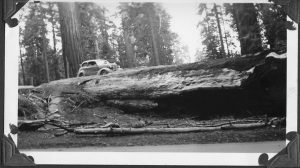 The practice was discontinued in the 1950s when it was determined the aging hollow log could no long support the vehicle weights. Yes, that’s Ethel peeking out from behind their Chevy! Auto Log is not the attraction that it once was. Since we had the parking area to ourselves we had some fun and parked cross-ways in the parking lot. No park rules were broken in taking this photo! The story of the Auto Log is being forgotten. We asked a young Park Ranger in the visitor center where the Auto Log was? He tried to direct us to Tunnel Log which is something completely different created by the Civilian Conservation Corps in the 1930’s not too far from the Auto Log. He was surprised when we shared our photo of Earl and Ethel’s 1937 Chevy parked on a prone tree. Another Park Ranger put him right! Historical photo of the Auto Log in the early 1920’s taken on the reverse side. Reverse side of the Auto Log today. Condition on top of the Auto Log today. There was another picture in their album that we tried to locate at various national parks along our way. It was a picture of Ethel on a stone stair hugging a pine tree. The photo’s placement in their album offered a few hints that in the end turned out to be no clues at all! 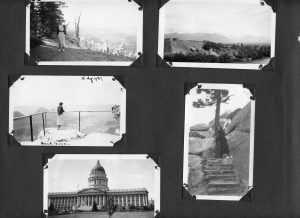 The photo was located on a page with pictures of Bryce NP, Grand Canyon North Rim, the Utah Capitol, and St. George UT. Carl had always thought the location was along the trail to the Bright Angel Point at Grand Canyon, but on arriving at the North Rim we found no match. The stone at the North Rim GC was all limestone and the stone in the photo appeared to be granite. The GC Park Rangers suggested we look in Yosemite. Top Left, Bryce NP; Top Right, St George, Utah; Middle Left, Grand Canyon North Rim; Lower Left, Salt Lake City, UT; Bottom Right, unknown location ??? This photo might be best viewed on a laptop or large monitor. In Yosemite we thought we were on the route to a match on our final climb to the rim at Glacier Point. Although there were lots of potential candidates nothing turned up. 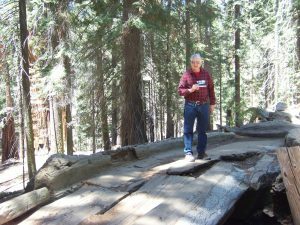 We did not pursue a Ranger’s suggestion that the one-mile hike to Vernal Falls bridge might have been the location. We had already hiked some distances that day and as with Earl’s picture we were OK not locating this specific photo. We had located so many difficult photos already. 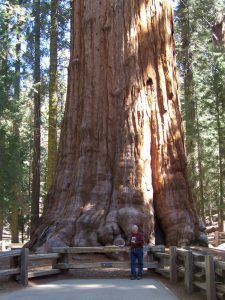 At the Sequoia NP, we engaged another Park Ranger at the Visitor Center to see first if she knew where the picture of Earl and the Sequoia were taken? 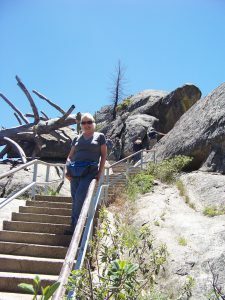 She could not, but when we shared Ethel’s photo on the stair without hesitation she said it taken on the climb to Moro Rock. We were on the hunt again! Moro Rock is granite rock formation near the far south end of Sequoia NP. It is mostly devoid of vegetation and stands about 250 above any surrounding terrain. Its summit provides stunning views in all directions of the mountains and valleys that make up the park. 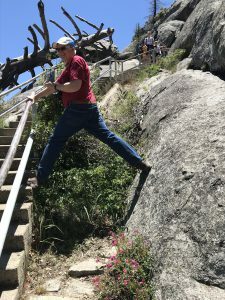 In 1931 the Civilian Conservation Corps installed a stairway to the top replacing a wood stair constructed in 1917 that had deteriorated already by the late 1920s. The CCC stair is now listed on the National Registry of Historic Places. 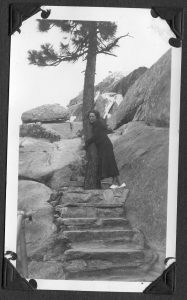 As we climbed the stairs and pathways across bare rock, about 2/3 of the way to the top, our hearts raced as we rounded a bend and “all the stars aligned.” The tree that Ethel had hugged was gone and another much larger tree had fallen into the area of the original photo. 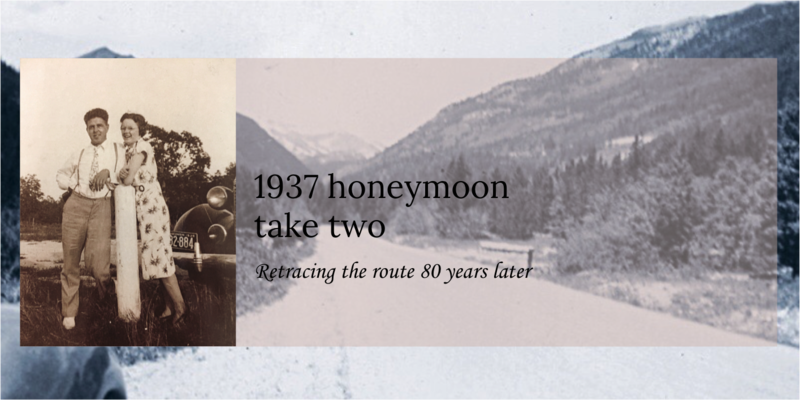 But as we checked the rock formations, indentations, and cracks over and over again we shook inside knowing that this was place of a seemingly random moment in time shared by two people in love 80 years ago. We had found the location of another mystery photo! On a visit to the park concessions store we found that the concessionaire had another postcard in its classic travel series of posters and cards using a vehicle similar to Earl and Ethel’s ’37 Chevy! Buy one if you can. 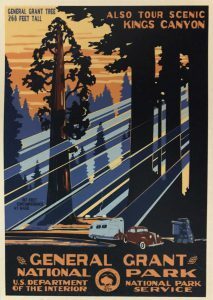 General Grant National Park was the original name of what is now Kings Canyon NP. 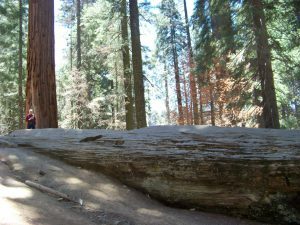 The park adjoins Sequoia NP and the two are jointly administered. 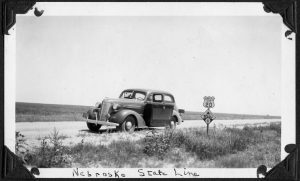 Period postcard recreation for Grant National Park with 1937 era Chevy lookalike! We should note that our route took us first north to Yosemite and then back south to Sequoia. This was because lodging for us was available inside Yosemite early in Memorial week but not later that week. Earl and Ethel likely went to Sequoia first from LA and then on to Yosemite. In the end we were pleased with how this worked out for us. Yosemite is extremely people busy even during mid-week. This was not the case with Sequoia. In Sequoia we got to kick-back on a slower pace and relax. 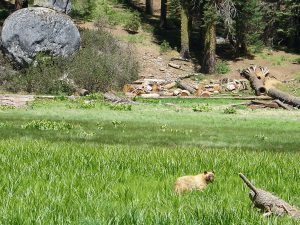 We feel so fortunate that Earl and Ethel left this trail for us to rediscover and enjoy probably just as much as they did! Almost forgot, we got up close and personal with one of the Sequoia’s bears. We did keep our distance! Incredible! How fortunate you were able to make all these finds. A treasured time and a feeling of accomplishment. Congratulations!